The 50.0% Fibonacci and the trend line held pretty nicely, as the pair bounced higher and I was able to ride the intra-day trend. Unfortunately for me, the move wasn’t sustained, topping out near the 83.00 handle. My take profit point didn’t get hit and I had to close early because the European session was coming to an end. I also caught a bit of bad luck as at the end of the European session, the markets were hit with some rumors out of China that the People’s Bank of China may make another round of monetary policy tightening. However, that was short lived as a couple hours later, higher yielders were back in the game! I ended up closing my trade at 82.59, leaving me with a gain of 23 pips. I’m a little disappointed that I couldn’t bag more pips on this trade, but just like in sports, I have to follow the rules. If I don’t, I risk getting a technical and get thrown out of the trading game! Earlier today, Australia came out with some weaker-than-expected numbers on its labor market, which caused the Aussie to tumble down a couple of pips against other major currencies. The employment change report showed that only 4,000 net jobs were created, and not 15,200. Still, the Aussie’s drop was hardly convincing, which gives me reason to believe that something is keeping it afloat. In my humble opinion, the Aussie is being held up by its relatively high interest rates. Against the yen, the currency’s interest rate differential is a whopping 3.9% (4.0% vs. 0.10%), making it one of the best candidates for carry trade. Couple this with the prospect of further rate hikes by the RBA, currency traders favor a long AUDJPY stance. No economic data coming out of Australia and Japan but expect the US trade balance and weekly unemployment claims today. 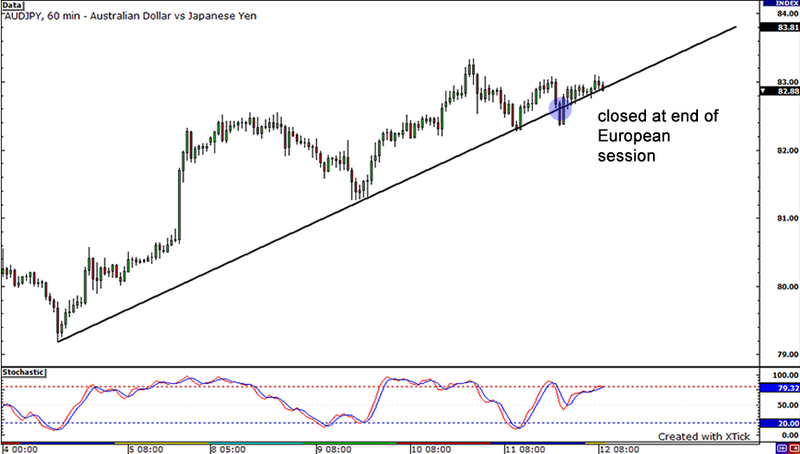 If these come in better-than-expected, we could see risk appetite surge again and take the AUD/JPY higher. Now, I’m looking at the charts and I see that the pair is sitting just above a rising trend line. It also happens to line up with the 50.0% Fibonacci retracement level. Looking back, it appears that the 82.30 to 82.40 price levels have been areas of interest in the past. With stochastics entering oversold conditions, I think this could be an opportunity for me to buy on the short term uptrend. I’m setting my stop loss past the 61.8% Fibonacci, at 81.90. This would also be past yesterday’s lows. 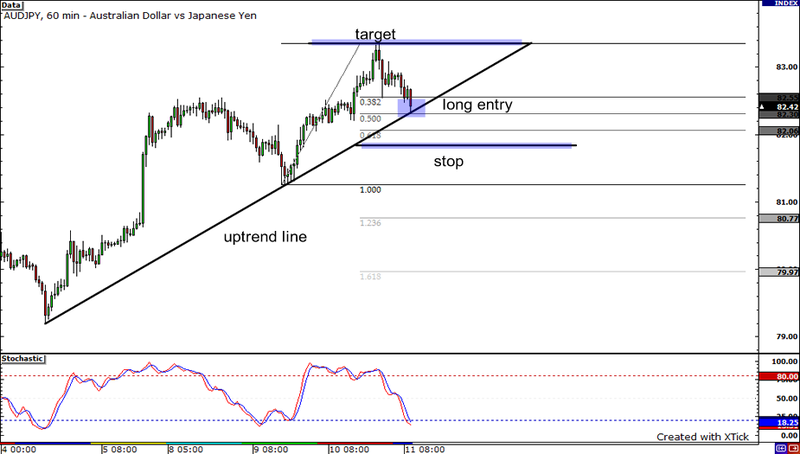 I’ve set my take profit near yesterday’s high at 83.30. I think this gives me a pretty decent reward to risk ratio. I’ll hold on to this day trade until the end of the European session.